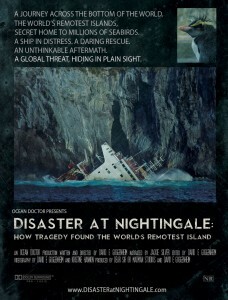 Ocean Doctor president, Dr. David E. Guggenheim will present his documentary film, Disaster at Nightingale: How Tragedy Found the World’s Remotest Island at the 4th Annual New York Wildlife Conservation Film Festival, October 15-20, 2013. He will also be taking part in a special panel discussion on Sunday, October 20, 2013 during the festival. While on an expedition in the South Atlantic from the tip of South America to the tip of South Africa, marine scientist Dr. David E. Guggenheim witnessed and filmed the worst environmental disaster of his life: A shipwreck that unleashed a catastrophic oil spill at the doorstep of the second largest concentration of seabirds in the world, home to 65 percent of the world’s population of the endangered Northern Rockhopper penguin. Disaster at Nightingale tells the story of an ecological catastrophe that few know occurred, in a place that few know exists, resulting from a growing global threat that few are aware of.